Feb 5 (AZINS) The VHP on Tuesday said its campaign for building Ram Temple in Ayodhya has been suspended till general elections are over, as the Hindutva organisation does not want it to become an election issue. The Vishwa Hindu Parishad (VHP), which has spearheaded the Ram Janambhoomi Movement, has been running a campaign across the country for the past several months, demanding a law in Parliament for building the Ram temple at the disputed site in Ayodhaya. As part of the campaign, the VHP has held rallies across the country, and is meeting Parliamentarians across party lines. 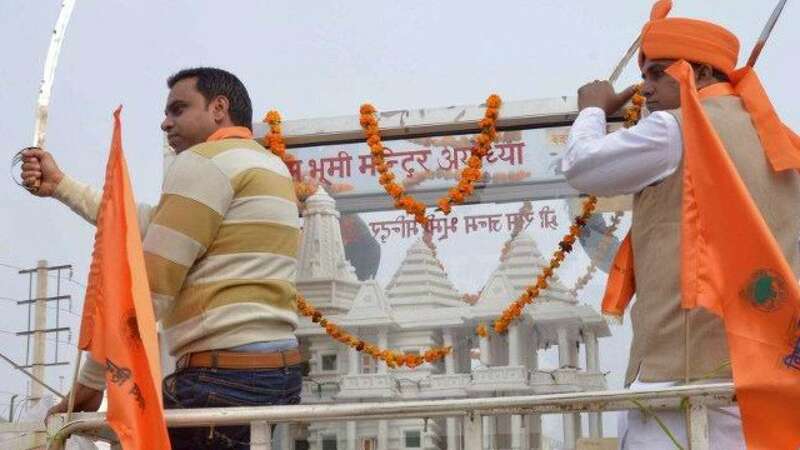 "The VHP has decided to suspend its campaign for constructing the Ram Temple at Lord Ram's birthplace in Ayodhaya till the General Election process gets over, as the organisation does not want it to become an election issue," said VHP's international joint general secretary Surendra Jain. Jain said the organisation is committed to its cause for building Ram temple in Ayodhaya and will decide the future course of action once the new government is formed.The announcement comes just days after a religious congregation called by the VHP at Allahabad, on the sidelines of the Kumbh, adopted a resolution saying Hindus will not rest and also not leave others in peace until a grand temple is built at the birthplace of Lord Ram in Ayodhya. The general elections are expected to be held in April-May.